History Channel has announced the upcoming return of Swamp People. Season four will kick off on Thursday, February 14th. It’s unclear how many episodes have been ordered this time around. The past years have had between 10 and 22 installments each. New York, NY, January 23, 2013 – Welcome back to the Swamp! Troy, Bruce Mitchell, Ron, RJ, Jay Paul, Liz and Junior are returning to HISTORY bringing us deep into their world on the Atchafalaya Swamp, America’s Last Frontier. Season Four of SWAMP PEOPLE premieres Thursday, February 14, 9pm ET/8c. Season Three of Swamp People averaged 4.4 million total viewers and 2.3 million A25-54 impressions, up +7% and +10% respectively from Season Two, and set a new record for the series. Among A25-54 it ranked as the #6 series in all of ad-supported cable for 2012. It was also #5 among M25-54 with an average of 1.3 million viewers in the demo. Season Four of SWAMP PEOPLE follows the intrepid Swampers as they battle through the wrath of Hurricane Isaac which robs them of five precious days of their short alligator season. In the storm aftermath, they must face down massive fish kills, flooded hunting grounds and gators that just refuse to take their bait. And if that’s not enough, there are new predators on the bayou – in the human form. There are Texas interlopers in Pierre Part, a wide-spread epidemic of poaching in Louisiana and a plague of new hunting partner challenges as they attempt to tag out in their most difficult season yet. · TROY is forced to hunt with a rusty partner – his city-slicker oldest son, Brandon, back to the swamp for the first time in 10 years. Also, Troy must deal with invaders in his own hunting grounds – a couple of brash Texans with something to prove. · JACOB is paired up with his brother, Chase. The pressure is on, as Jacob feels the necessity to prove to his dad that he’s the heir to Landry family throne. But, he’s going to have to survive a brutal season. · LIZ, as a consequence of Hurricane Isaac, temporarily loses her trusted hunting partner, Kristi – forcing her to hunt with her 19 year old daughter, Jessica. To add to her struggles, she is freshly recovering from surgery and is hunting against doctor’s orders. · R.J & JAY PAUL, after years of hunting in unfamiliar hunting grounds, the two are finally back on their native land and must prove themselves to the entire Houma tribe by landing the biggest gators they can – even if it means going to extreme measures to succeed. · BRUCE & RON, after failing to tag out last season are determined to redeem themselves. But Hurricane Isaac has dealt the team the worst blow in the swamp – as their hunting grounds are destroyed and access is blocked for days after everyone else is hunting. The team must overcome cannibal alligators, jinxed yellow gators and the near loss of Bruce’s beloved hunting dog, Tyler, if they have a chance at tagging out. · JUNIOR, pressured by the shortened gator season, pushes his son, Willie, to his wits end. After getting bit by a gator and shot again by his father, Willie jumps ship forcing Junior to recruit his wife, Theresa, to help him finish the season. · GLENN GUIST is trying desperately to define life without his brother, Mitchell, who died suddenly from a massive heart attack in the off season. His friends rally around him as they look to fulfill Mitchell’s dream and unfinished project. · T-ROY Broussard and Harlan “BIGFOOT” Hatcher from Texas are the top alligator hunters in the Lone Star state. They are trying to break into the Louisiana gator hunting scene after negotiating some tags from a Pierre Part landowner. How will they fare on Troy Landry’s turf? · JEROMY Pruitt and DAVID LaDarte from Marion, LA are a stepfather / stepson team who are some of the most creative (and quirky) hunters on the swamp. Using all sorts of unconventional bait, boats, and ammunition has put this pair at the top of the list of Northern Louisiana hunters. The two are determined to hunt down “The Beast Of The East,” a legendary massive gator. · ZZ LOUPE may only be 16 years old, but he’s lived on the swamp and handled gators since he was in diapers. At 6’2″ and 260 pounds, he’s a child prodigy that is a force to be reckoned with – possessing a high level of swamp savvy and ingenuity. In his first “professional” hunting season, ZZ has teamed with legendary swamp veteran, TOM CANDIES. Deep in southern Louisiana there are nearly 1 million acres of flooded forest, marshland and bayous – the Atchafalaya Swamp – which is unlike anyplace else in the United States. It’s a hidden world, a place where nature still rules – one of the least known territories in the United States. But a hardy breed of “Swamp People” knows the secrets of this dangerous mysterious territory. Most are Cajun descendants of French-speaking settlers who came from Canada in the 1700s – and their way of life has been fundamentally the same for generations. They are America’s forgotten pioneers. SWAMP PEOPLE is produced by Original Media for HISTORY. Executive Producer is Charlie Corwin, William Pruitt and Adam Briles. Executive Producer for HISTORY is Zachary G. Behr and Mary Donahue. What do you think? Have you seen this show? Is it worth watching? 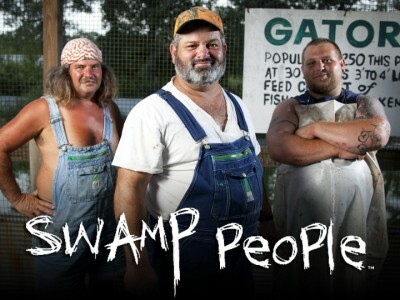 More about: Swamp People, Swamp People: canceled or renewed?